[151 Pages Report] In this study of the automotive chassis market, 2016 has been considered as the base year and 2017–2025 as the forecast period for estimating the market size. The market was estimated to be USD 48.37 Billion in 2016. The automotive chassis market, in terms of value, is projected to grow at a CAGR of 5.59% from 2017 to 2025. The report analyzes and forecasts the global automotive chassis market size, in terms of volume (units). 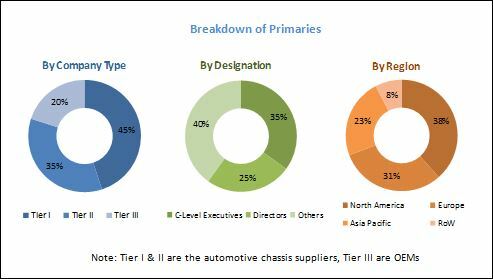 The report segments the automotive chassis market and forecasts its size, by volume & value, on the basis of chassis type, material type, vehicle type, electric vehicle type, and region. It provides a detailed analysis of various forces acting in the market (drivers, restraints, opportunities, and challenges). It strategically profiles key players and comprehensively analyzes their market shares and core competencies. The report also tracks and analyzes competitive developments such as joint ventures, mergers & acquisitions, new product launches, expansions, and other activities carried out by key industry participants. The research methodology used in the report involves various secondary sources such as International Organization of Motor Vehicle Manufacturers (OICA), China Association of Automobile Manufacturers (CAAM), and others. Experts from related industries and suppliers have been interviewed to understand the future trends of the automotive chassis market. The bottom-up and top-down approaches have been used to estimate and validate the size of the global market. The market size, by volume, is derived by identifying the total production volumes and analyzing the demand trends. The figure given below illustrates the break-up of the profiles of industry experts who participated in primary discussions. Design for automotive chassis systems such as ladder chassis, monocoque chassis, and modular frame chassis has been evolving. The new trend in the automotive industry is to manufacture chassis with lighter material, which will make the vehicles lighter without compromising on the safety of the vehicle. Monocoque chassis is estimated to hold the largest market share in the automotive chassis systems market. With the implementation of mandates to make vehicles more safe and fuel efficient with minimum emission, monocoque chassis is expected to grow better than other type of chassis such as ladder chassis in passenger car segment. Whereas in HCV segment, modular chassis is expected to grow well owing to its advantages such as providing better stability to vehicle body as well as light weight in comparison to conventional ladder chassis system. By raw material, the market for aluminum alloy is estimated to experience the highest growth during the forecast period. With regulations to make vehicle more environment friendly and the rapid adoption of electric vehicles, aluminum alloy-induced chassis system is to gain strong affinity from automotive OEMs. And during the forecast period, aluminum will gain larger market share in comparison to other raw materials for manufacturing of chassis systems. In electric vehicle type, skateboard chassis will gain larger market share during the forecast period. Skateboard chassis consists of a frame that enables it to hold the massive battery pack that spans the entire area of the frame i.e. between the four wheels along with the suspension, brakes, and the cylindrical motors. Furthermore, this chassis system can support different body styles for different applications. 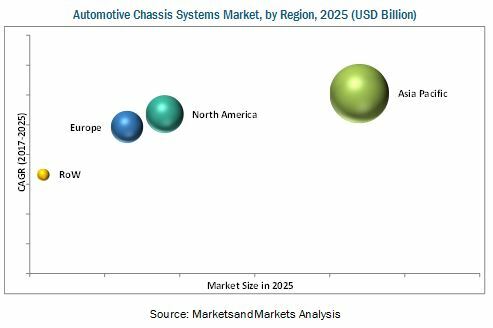 The Asia Pacific region is estimated to dominate the automotive chassis systems market, in terms of value, in 2017, followed by North America and Europe. Demand for lighter weight chassis has increased in recent years, with suppliers catering not only to the domestic demand but also to the overseas demand. Moreover, in 2025 the region is likely to lead the electric vehicle market, in terms of volume, followed by Europe and North America, as key suppliers are significantly investing to expand their presence in Asia Pacific. In near future, shared mobility will be the face of automotive market. To decrease traffic congestion and to make travel more economical, shared mobility will be strongly preferred by commuters. With increase in shared mobility, individual purchasing of car will decline. Fall in sales of vehicle per individual will negatively affect the production of vehicles, which will, in turn, reduce the demand of chassis. Automotive chassis systems market is dominated by key players such as Continental (Germany), ZF Friedrichshafen (Germany), Magna (Canada), Schaeffler (Germany), Aisin Seiki (Japan), CIE Automotive (Spain), Benteler (Germany), Hyundai Mobis (Korea Republic) and AL-KO (Germany).